Have you been experiencing neck or back pain for some time now? Patients are often able to alleviate their chronic spine pain using a course of conservative treatment — possibly including pain medication, heat/cold therapy, and physical therapy — but sometimes only a spine surgeon can provide relief. If that’s the case for you, you’ll be glad to know that Tahoe Fracture & Orthopedic Medical Clinic’s team includes experienced spine surgeons who are available to treat patients throughout South Lake Tahoe, California, and the surrounding area. 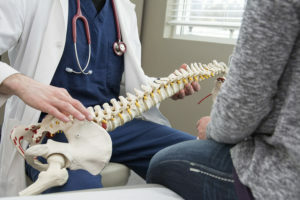 Bulging/herniated discs — When pressure is exerted on degenerated spinal discs, it causes them to bulge outward toward the spinal canal (a bulging disc). If the outer layer of the spinal disc is so weakened that it tears, the inner contents will begin leaking out into the surrounding area (a herniated disc). A spine surgeon may be able to address this issue using a discectomy. Spinal stenosis — Spinal stenosis generally refers to the narrowing of the spinal canal, which can be caused by a number of degenerative conditions, including herniated discs and bone spurs. A spine surgeon can use a variety of decompression procedures to treat this issue, including a laminectomy, a laminotomy, and a corpectomy. Spinal fractures — Spinal fractures often compress the spinal cord and nearby nerve roots, which can lead to radiating pain, trouble walking, and even paralysis. A spine surgeon can perform a kyphoplasty to restore the correct shape to a damaged vertebra and thereby maintain function. If you’re interested in meeting with a spine surgeon or one of our other orthopedic specialists to discuss your neck and back pain, please contact Tahoe Fracture & Orthopedic Medical Clinic today. We have a number of locations throughout the area, including one on Third Street in South Lake Tahoe, CA.